Coming up with new ideas for baked goods can lead you down some interesting avenues, and this recipe for pistachio Manuka honey rolls is certainly one worth venturing down the rabbit hole for. Made with such delicious flavors as cinnamon, orange zest, butter, Manuka honey, and, of course, pistachio, these rolls ask would-be bakers to not only take their time making these splendid pastries but to also try something they likely have never had before. Fortunately, any risk involved is worth the reward you get at the end, offering up to 32 servings of a dessert you can share with the entire family or, more ideally, an entire party. To begin, move one of your oven racks to the middle level and preheat your oven to 375 degrees Fahrenheit on the Bake setting. 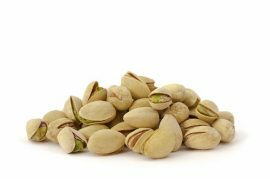 Using a blender or food processor, throw the pistachio nuts, the sugar, the orange zest, and the cinnamon in and grind till the nuts appear to be finely chopped. Move the contents to a medium-sized bowl. Place one of the phyllo dough sheets onto a clean work surface, leaving the rest of the sheets under damp towels till every sheet has been used. Brush your first phyllo dough sheet with the melted butter, top it with another phyllo sheet, and then brush on more melted butter. Spread the phyllo sheet lightly and lengthwise in four strips. Roll each strip up, starting from the bottom before placing on a baking sheet lined with parchment paper, with the seam-side facing down. Continue this process with the rest of the 14 phyllo sheets and the nut filling. Once finished, bake the rolls for about 15 minutes. With the rolls still warm, you can drizzle on the Manuka honey. Allow the rolls to completely cool before serving. You should have about 32 servings total, and you can store the rolls for up to two weeks in your refrigerator.